Hula Bay IPA, Our Drink of the Week! Left Coast Brewery, makers of Voo Doo American stout, Trestles American IPA and the oh-so-happy-to-be-hoppy Hop Juice double IPA, routinely partners with other brewers for special one-off ales. Witness this year’s collaborations with fellow San Clementians Artifex and Pizza Port. The partnering was kicked up a notch earlier this summer when Left Coast hopped over the San Onofre nuke plant’s big boobsicles to team up with the Carlsbad-based, Hawaiian-themed Islands restaurant chain, which has more than 50 locations in California, Arizona, Nevada and Hawaii. The result: Hula Bay IPA, which like a good double Indian pale ale has a hoppy blast up front that gives way to a complex mélange of pine, citrus, grapefruit and tangerine notes in the back. It’s bold and refreshing at once. 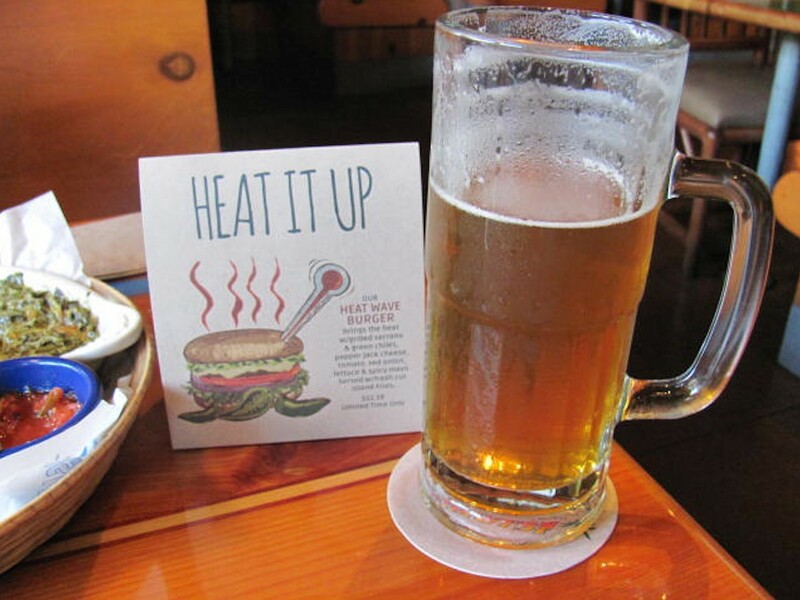 But this belly inflater likes his IPAs with food, and I found the Hula Bay IPA perfect for dousing the fire in my mouth caused by bites of Islands’ Heat Wave Burger, which has ground cow topped with grilled Serrano chilies, grilled green chilies, melted pepper-jack cheese and spicy mayo. Like the brew, the burger is available for a limited time. Thinking I was out-smarting my tongue, I ordered the tallest Hula Bay IPA so that I could get some swigs in before and after sweating out the spicy burger. But, truth be told, it was not enough and I was forced to order an extra cold, milk shaky Colada Sunset, Islands’ twist on the classic piña colada with pineapple, coconut cream and a float of Myers’s Rum. So come to Islands for the Hula Bay IPA drink of the week, stay for the Colada Sunset dessert of the week. Hula Bay IPA is served at the Islands restaurants in Anaheim Hills, Brea, Foothill Ranch, Fountain Valley, Fullerton, Huntington Beach, Irvine (there are two), Mission Viejo, Newport Beach, Orange, Seal Beach and Long Beach (two there also). Find them via www.islandsrestaurants.com.